The 15th was what, Tuesday? This little guy barely had enough time to hit the mailbox before Eric Sorrells started putting his custom magic on it. And I really dig the spin he gave this minifigure from October Toys and 3DRetro. 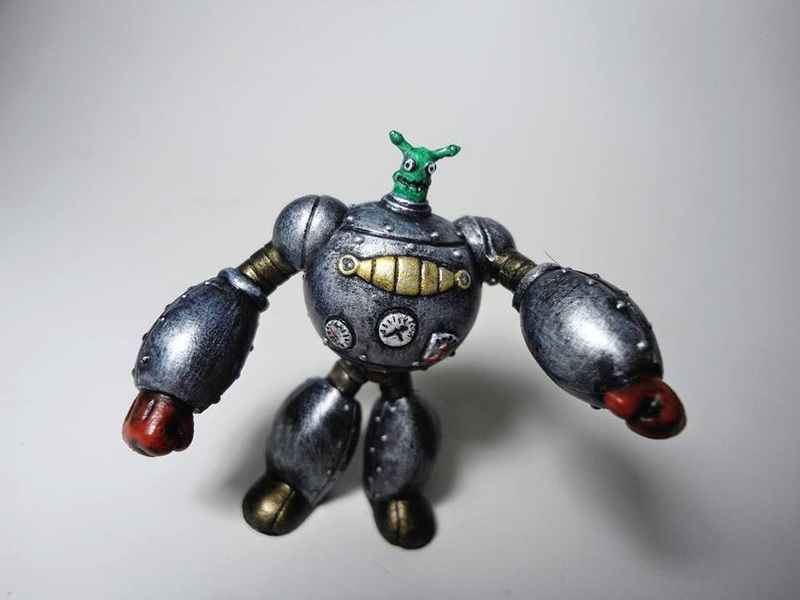 Giving the head a green paint app changed the whole concept of the figure, from clockwork monster to a "lil green wormy pilot" of a steam-powered suit of armor. The metal finish, detailing and other tweaks Eric gave this piece really make it pop. You can add it to your shelves now, at the Ersico webstore. 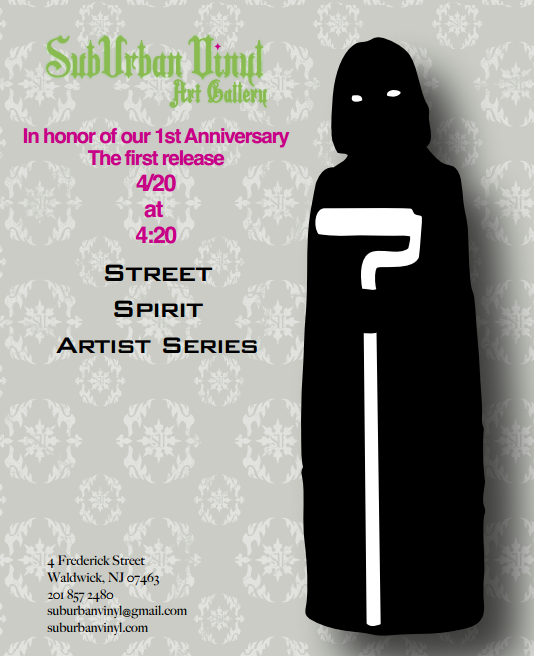 Come celebrate with SubUrban Vinyl as the mark their one year anniversary with the release of the Street Spirit Artist Series at 4:20PM on 4/20. 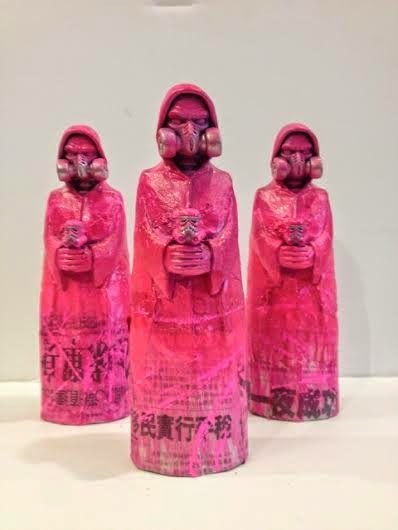 Street Spirits are sculpted by Nemo and rotocast by Task One, there will be six pieces available. Which artist will it be? Also SubUrban Vinyl will be having a sale in store and online starting Friday 4/18 - Saturday 4/19. All in stock items (Excluding Custom art and new releases) will be 20% off. They will also have a 20% off coupon code going out to their newsletter subscribers on Thursday! So sign up!! 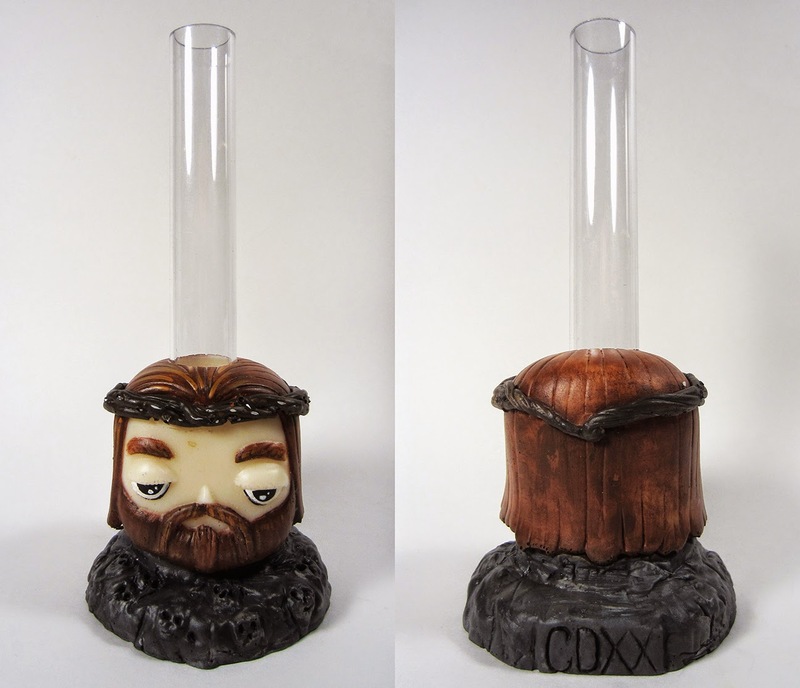 …and so on 4/20, falling this year on the Christian holiday of Easter, Forces of Dorkness and Tenacious Toys bring you “Jesus H. Waterpipe” a.k.a. “The Bong Christ”. Each piece is a solid resin hand painted graven image topped with a fully modern polycarbonate tube. The piece stands 7” tall and 3” wide. Each piece is hand made and will cost $40 plus shipping. This unit is not functional as an actual waterpipe. Not because FOD can’t make one this small, but because using one this small is a stupid idea. More than likely you’ll just end up with a mouthful of water every time…with that said, it is watertight and can be used for things such as a bud vase, the world’s smallest column aquarium, a XXL shotglass, a spittoon, a jelly bean holder... the options just go on and on and on. Jesus H. Waterpipe will drop at 4:20PM EST on 4/20 on the Tenacious Toys Super Series Sundays page. 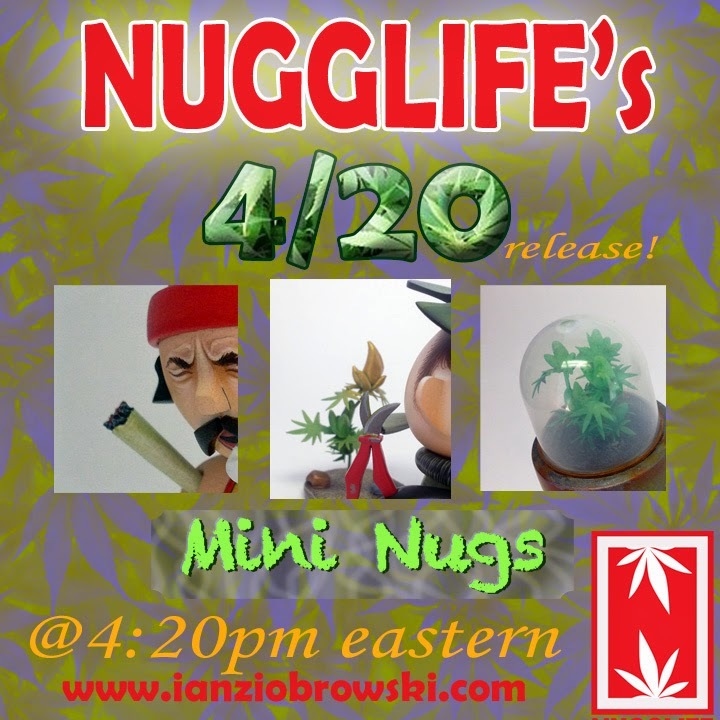 This Sunday 4/20 at 4:20pm EST, Ian will be launching new customs on his site. They will be a total of 4 custom Dunnys and Mini Nugs Series 3. The custom Dunnys include a Cheech and Chong set, Nuggs ("the Golden Nugget") and a "hydroponics grow dome." Prices range from $130 to $300. 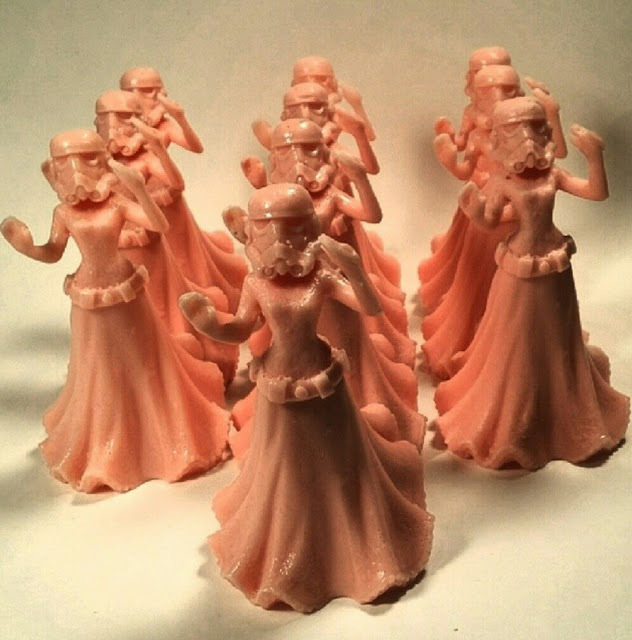 Scott Kinebrew's "Lady Trooper" are 5.5" tall, 100% resin figures cast in keshi pink featuring the body of a princess and the face of an oppressive empire. Created by Forces of Dorkness and Vinylgrrrl these will only be available through Dream In Plastic. Five will be available on May the 4th at 5:04 pm est at dreaminplastic.com and the other 5 available at 6PM on May the 10th at Scott's Masks and Minions show also at Dream in Plastic. 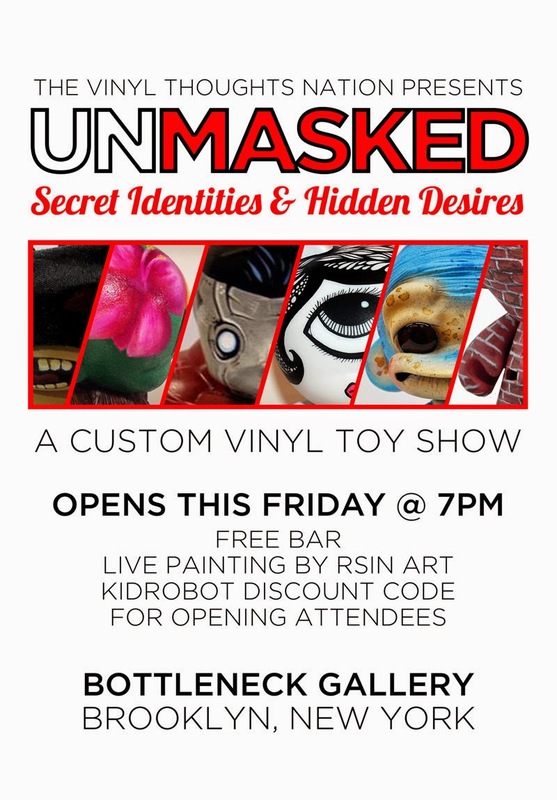 Come to Brooklyn's Bottleneck Gallery to attend the opening of the first NYC event thrown by the Vinyl Thoughts Nation: Unmasked: Secret Identities & Hidden Desires. Featuring an open, free bar (magic words), live art by RSIN and even a Kidrobot discount code for attendees, this promises to be an excellent event. Opens at 7PM on Friday April 18th. PJ Constable has some great custom pieces leftover from ToyCon UK. Available in 2 versions, PJ's Eat or be Eaten custom resin Dunnys come in his OG colorway and a ToyCon UK Colorway. The ToyCon UK colorway also features a different sculpted upper head portion, which allows the Dunny to be displayed upside down, a very nice feature. The ToyCon UK Colorway retails for 75 GBP plus shipping (~$126 plus shipping). The OG Sculpt and colorway retails for 70 GBP plus shipping (~$118 plus shipping). Be sure to check out PJ Constable's customs and pick up an awesome little creature. Each come signed and numbered. Haus Of Boz had a few wonderful Dunny's left over from ToyCon UK. If you don't follow her on social media, chances are you missed out on a few of the ones put up in her online store. As of writing this, both Rhino's Toxa and Orchid, were still available at 64.99 GBP each plus shipping (~$109 plus shipping). Each piece has great sculpted features and a detailed paint job. The Orchid Rhino has a nice sculpted and painted orchid as a main feature of the figure, while Toxa features a "toxic" green and black paint schema. These would make great additions to any collection. ToyCon UK 2014 happened over the weekend and lucky for the rest of us who were not able to make it to the event, left over stock is being made available online. This time, A Little Stranger (Holly) has a few items left over from ToyCon UK. A limited edition print titled "My Beloved Monster and Me" is up for 20 GBP plus shipping (about $34 plus shipping). This print is limited to 5 and each is signed and numbered. Also available in the online store of A Little Stranger, is the Toy Con UK mascot in a nice smoke vinyl with glitter, highlighted with silver and black paint. The mouth and eyes are available in a Acid Green and Deep Blue colorway, each selling for 35 GBP (~$58) plus shipping. A nice color addition for this cool figure. In addition to these great ToyCon UK leftovers, there are also some great original drawings and paintings available. Be sure to check out the entire A Little Stranger online store, there is definitely something for everyone. For all those who were unable to attend TOYCON UK this past weekend, artists are starting to put left over stock online. One of those companies, NEMORI (the joint venture with Cris Rose and Lunabee) put up these great resin Windermere Owls. Priced at 25 GBP each plus shipping, or roughly $42 plus shipping, these resin owls are roughly 3" tall and are an original sculpt. All the owls are uniquely painted and some even come with a nifty hat. 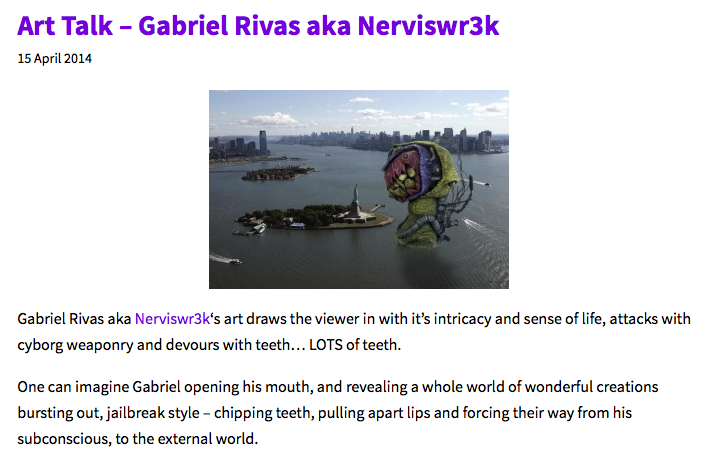 Another great thing about the NEMORI world, is the story behind all the fun little creatures being created. Be sure to head on over to the NEMORI online store and pick up one of these, and possibly a Brightfiled Bunny or Burntwood Bear.